HEIGHT: The upper height limit is 148 cms. There is no lower limit. All ponies should be Judged equally regardless of height. They are normally shown in 2 height sections 138 cms and under (competition type A) and over 138 cms (competition height B). 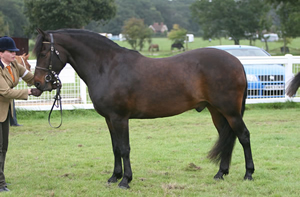 TEMPERAMENT: The New Forest Pony has an ideal temperament and should be very easy to train. Ponies registered in the X Section of the Stud Book may not adhere to the Breed Standard. These ponies are not permitted in New Forest Pony classes. Ponies are shown unplaited, but may have lightly pulled manes and tails. The jaw line and heels may be trimmed, but the whiskers should be left untrimmed. Clipping, except for the legs, is allowed for ponies 4 years and over, in in-hand, ridden and working pony classes. Yearlings should not be shown in bits. Stud Stallions 2 years and over may be shown in bridles with bits. Chifney bits are not allowed in any circumstances. Judges have been asked to take behaviour and temperament into account and not to Judge ponies whose behaviour they consider to be a danger to either its handler/rider or other competitors. Such a pony will be asked to leave the ring. No commercial, stud, or pony names to be displayed in the ring. 2 year old colts are permitted to be shown without a licence.